“Listen! A farmer went out to plant some seeds. As he scattered them across his field, some seeds fell on a footpath, and the birds came and ate them. Other seeds fell on shallow soil with underlying rock. The seeds sprouted quickly because the soil was shallow. But the plants soon wilted under the hot sun, and since they didn’t have deep roots, they died. Other seeds fell among thorns that grew up and choked out the tender plants. Still other seeds fell on fertile soil, and they produced a crop that was thirty, sixty, and even a hundred times as much as had been planted!" Jesus used parable a lot in his teaching, and many of them had to do with nature. Our environment has always pointed the way to God, Jesus was just trying to help us see that. (Psalm 19:1) Today I'm not so much focusing on which type of soil you are, if you have been in a church for any length of time you have probably heard a sermon preached on that. What I do want to point out is that where you are right now is not where you need to stay, not if you don't want to. 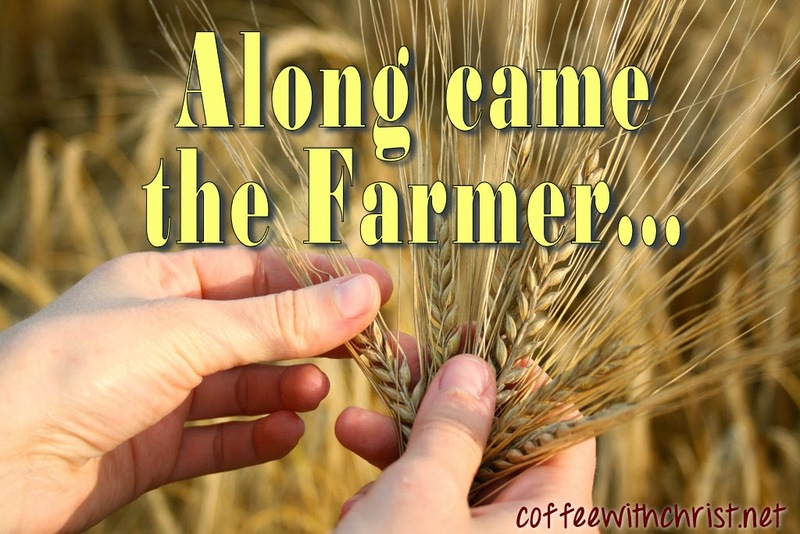 I believe there is a reason that Jesus chose a farmer for this parable. A farmer spends his life preparing soil for crops. When he starts a new field it is rare that it is ready for planting. Work must be done to remove unwanted paths, vines, rocks etc. It's a process. We are too, and God knows it. That's why He keeps sowing in the same field. Think about the first time you heard about God and His Kingdom. Did you immediately say you were done with your current life and you were ready to surrender all? Probably not. The seed was sown along the path. Along comes the farmer, though, who does a little work in the field. Now that path is gone, and you hear the Word again. This time you do decide to accept His gift....but you don't take the time to study His Word, to talk with Him and after time you drift away. The seed was sown in rocky soil. Along comes the farmer, though, who does a little work in the field. The rocks have been removed and you hear the Message of God again. Again you give your life to Jesus and you do study. You take time to get to know our Father, His will, His desires, His expectations, His sacrifice. You grow close to Him....until you have to start making the hard choices. You have to choose between keeping friendships or your relationship with God. You loose your job and have to choose between trusting God to provide or taking things in your own hands. Your loved one becomes seriously ill and you have to choose between trusting God to do what is best, or turning your back on Him. Things get hard and you walk away. The seed was sown in thorny soil. Along comes the farmer, though, who does a little work in the field. I don't personally know anyone who got it all right the first time. Fortunately we serve a God who doesn't give up on us, He keeps coming along and preparing the soil for the seed. (Deuteronomy 7:9, 2 Timothy 2:13) He continues to do a little work in us, preparing us for the seed to be planted, removing the rocks and thorns until we truly understand and then we begin producing fruit and in that fruit are more seeds. We begin assisting the Farmer in sowing the seed. How awesome is that! But God is such that He gives us free choice. He allows us to cling to our path, or rocks, or thorn bushes if we so choose. Clearing the field isn't easy work. It is hard, toilsome and often results in minor pains. The end result, however, - the harvest - is so much more bountiful in a field that has been properly cleared. I don't know about you, but I want that bountiful harvest! So every time a rock is discovered, or a thorn bush pops it's ugly head up in the field, I work to remove it. Do you have some rocks or thorn bushes that need removed from your life? What is keeping you from growing deep roots or trusting God in the hard times? I encourage you to spend some time with God and ask Him to reveal them to you. Then begin the labor of removing them. I promise that the harvest will be worth the effort!